This may look like your typical grassy hill. But don't be fooled! It's actually home to super-secret spies who camouflage their hideout with foliage. Don't be ridiculous, Dex. 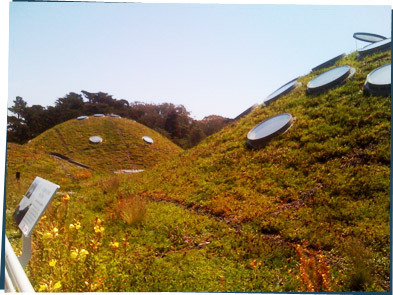 This is The Living Roof at the California Academy of Science in San Francisco! It's for a bunch of scientists — not spies! Their building is totally sustainable and they put a green roof on it — all kinds of things live up there. The soil and plants help regulate the building's temperature and those skylights open up to let heat out! Sure, that's what they want you to believe. But see that smiley face hidden in the hill? He gives it all away.